Successfully Added Cree LED Work Light - 27W, 1900 Lumens, Waterproof, Multipurpose: Vehicle Light, Engineering Light, Farming Light to your Shopping Cart. Cree LED 27W Work Light with indoor and outdoor uses, 1900lm, vehicle light, engineering light, backyard light, work light, farm light, flood light, etc., from one of the world's best LED producers, Cree. Cree LED is a world renowned American LED manufacturer who have been hailed as one of the industry's finest producers of LEDs. They are famous for their durability (die cast aluminum alloy housing), longevity (50,000 hours on average) and brightness (1900 lumens), to be precise. When you buy a Cree LED, you are buying name brand; when you buy through Chinavasion, especially wholesale, you are getting name brand for a great low price. 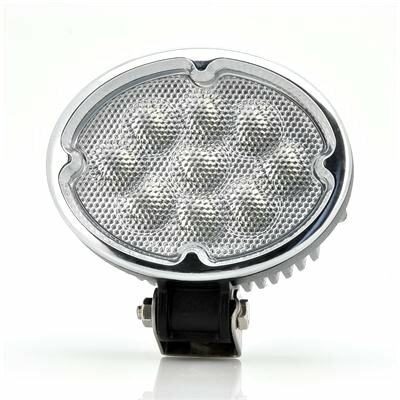 So don't compromise - if you need an LED that can work long and hard, look no further than this 27W Cree LED Work Light. Perhaps the best part about this 27W Cree LED light is its versatility. All indoor and outdoor uses are within reach with this simple, multiapplication design that has a waterproof rating of IP65 and can work in extreme temperatures from -40 to 120 degrees Celcius. It can be used as an engineering light, a truck light, a car light, a farm light, a special vehicle light, an ATV light, an off road vehicle light, a back up light, a trailer light, a construction light, a garden light, a backyard light, a boat light and more. Wherever you think you can use it, there's a great chance this 1900 lumens Cree LED light is for you. In stock now, we guarantee that this 27W Cree LED Work Light can be dispatched within one working day with a 12 months warranty. Brought to you by the leader in electronic devices and wholesale Automotive LED Lights, Chinavasion.